The elections are over and we finally have a Governor. We should look back at the lessons of this election season. The closeness of the election should emphasize the importance of your vote. We are looking at a difference of under 6000 votes between the major candidates for Governor. There were multiple districts where recounts were ordered this year due to results as close as 4 votes. Every vote is important. The next General Assembly session will begin in early January when all new and returning members will be sworn in. We will now, for the first time in years, have a Democratic Governor. We have had the other major offices Democratic in past years but the Governor’s office had remained Republican. The Republicans did pick up more House members and one Senator with this election, but Democrats remain as the majority in both houses. Traditionally with a new Governor, there will also be major changes in the state Commissioners for all departments. How will the two parties work together now. With this new mix maybe bi-partisan cooperation will prevail. Legislators, including those recently elected, are already starting to put together proposed bills for the upcoming session. This year is a long session and bills beyond the budget will be allowed. Now is the time to contact your legislator if you have any ideas or suggestions for bills. The State Grange Legislative Committee has reviewed the resolutions that were passed the last couple of years to determine which ones would need legislative action. We are also reviewing the State Grange Legislative Handbook for update. This will be distributed to the General Assembly members and Granges. The Legislative Committee will be contacting the Granges at times concerning bills that we are following and encourage members to express their opinions on these bills. When contacting your legislators don’t just call up and say “I oppose/support Senate Bill (SB) or House Bill (HB) number ###.” While working there I was surprised at how many people would call and say just that. When I asked what the bill was about I would often get the response of “I don’t know, I was just told to call.” Know your subject before calling. If you write to or call your legislators be concise and informative. Tell them the bill number and subject of the bill you are communicating about. There are hundreds of bills proposed every year so they may not be familiar with that exact bill. Mention what in the bill you are concerned about and why you are supporting or opposing it. This will have much more impact than just calling with I oppose/support this bill or sending a postcard on which you fill in the blanks. The State of Connecticut website (http://www.ct.gov) lists all of the General Assembly members and how to contact them. Click on the Legislature menu item at the top of the page. If you do not know who your Senator or Representative are, you can look them up by your town. You can also follow or look up active bills at this site. 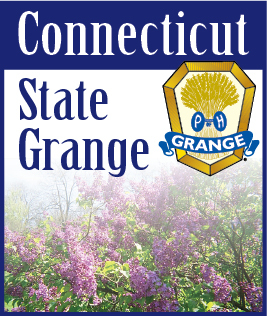 If you would like to be more involved with the activity in the General Assembly email me at legislative@ctstategrange.org and ask to be placed on our legislative action list. We will send out emails to concerned members when issues arise that need immediate action.